The vocalist with San Francisco-based experimental/noise outfit Oxbow, with whom he has released a number of records since their 1989 debut Fuckfest, Eugene S. Robinson is also a renown writer who has been published in GQ, The Wire, SF Weekly, Plan B, Hustler and many more publications, and is the author of two books, Fight and A Long Slow Screw, published in the last five years. 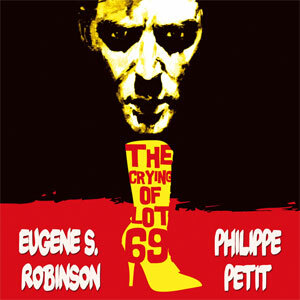 The Crying Of Lot 69 is Petit’s second release for Polish imprint Monotype, following last year’s CD/DVD Twist Of Fate with Lydia Lunch. In some ways, these two projects have a lot in common. In both cases, Petit builds deeply claustrophobic and dark soundtracks as aural responses to his interlocutors’ heavy narratives. Here, Petit is helped in his task by American avant-garde composer Rhys Chatham, Swedish cellist Helena Espvall and Strings Of Consciousness member Hervé Vincenti on acoustic guitar and synths. While this album is split into six distinct sections, it is actually built as one sonic piece, and the narrative flows from one part to another without clear split or break. All the way through, Robinson’s voice stands out from Petit’s oppressive and bleak soundscapes. His tone remains for the most part composed and poised and his diction implacably clear, but this only puts the gloom aspect of his texts into extremely sharp focus. ‘You can trust me’. The phrase may be inviting, but Robinson’s tone of voice is somewhat frosty and disturbing, and sets, right from the opening line, the tone for the next forty-four minutes. To add to the discomfort, Petit builds squeezed balloon noises and processed field recordings into a atonal drone into which Rhys Chatham, on trumpet, carves a series of abstract motifs. On Modern Trends In Modernity, Robinson’s voice breaks at one point, as if he was suddenly fighting back rampant rage, but he soon returns to the same calm delivery, as electronic pulses push against the strident shards of processed cello and guitar which form the bulk of the soundscape of the first half. And as the record progresses, the tension becomes more and more overwhelming as the voice appears ever so slightly off its usual pitch on Change In Total, and continues to almost imperceptibly shift toward inhumanity. This is echoed by Petit’s increasingly discordant sonic collages, and if Hervé Vincenti’s acoustic guitar emerges somewhat untouched out of the chaos on The Right Eye Cast, this doesn’t ultimately deflect from this record’s extreme bleakness. This album, announced as the first in a trilogy, is incredibly dense and disturbing. Purposely difficult to listen to, The Crying Of Lot 69 can at times become almost too intense, but it is also, like many of Philippe Petit’s releases, a deeply visceral and urgent piece of work which deserves to be heard.